So I'm really writing this as I listen. I'm so excited that I wanted to immediately start talking about this record. Four incredible musicians on the scene today. 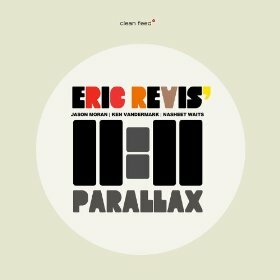 And two of my favourite musicians of the modern era (Vandermark and Moran) joining forces under the direction of Eric Revis to create a cinematic and powerful document of free jazz. This really unbelievable line-up formed in 2009 briefly for a few shows in New York before actually putting pen to chart in the studio. 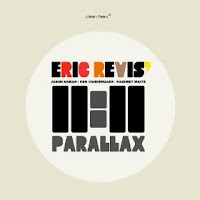 But the results of this session, Parallax, are some of the best you will have heard all year. And what better time for it to arrive than the final few weeks of the year. The opening "Prelusion" and "Hyperthral" present the combination of styles of the modern free movement and the crisp traditions each musician inhabits. Revis' composition tone is calm but always with a crisp sense of experimentalism through the spectrum. The trio of Vandermark, Waits and Moran sounds quite commanding and mature with Moran and Waits tearing through lines at a fierce pace. Vandermark sounds brilliant in an almost laid back manner than previous sessions. "MXR" is a pounding march led by Vandermark (on clarinet), Waits and Revis. It's fun yet tricky intertwined lines provide a challenging but fruitful listen. "Celestial Hobo" is a well structured improvised piece. Revis allows each musician an opportunity chart a course that is introspective and works the lines of the tunes dedication to author Robert Kaufman. "Winin' Boy Blues" sees the quartet gently reworking the Jelly Roll Morton classic. It's a beautiful Sunday Morning blues sent through a corkscrew. The group rise to the top of this piece with superb performances. This is one number I would love to see live. Eric Revis doesn't have a lot titles as leader. He is widely known as an essential band member. But with Parallax, Revis has entered the realm of significant composer. This session is simply outstanding and should not be missed by any jazz fan; you don't get a set of musicians together like this in today's modern scene. Don't miss out. Parallax is one of the best records of the year. Highly Recommended!